After a decade of eating nothing but tiramisu for dessert whenever I went to a restaurant I can call myself a true specialist when it comes to this famous Italian dessert. 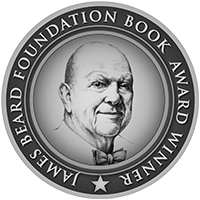 I love it passionately and although this phase of complete dedication ended many years ago I still order it sometimes when I see it on the menu. 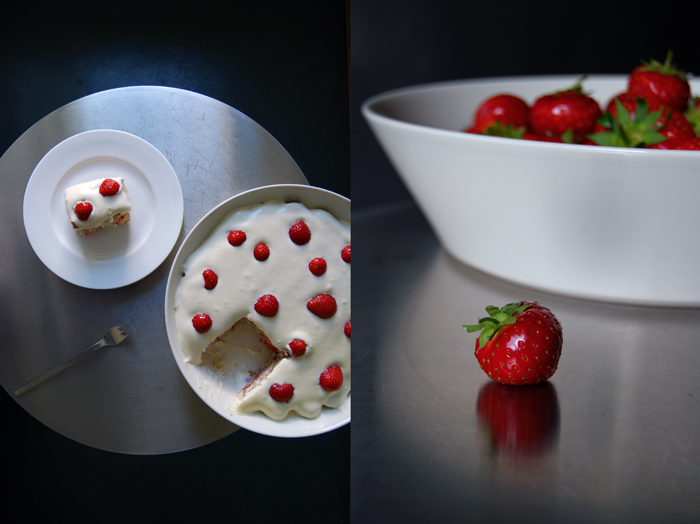 My sweet obsession wasn’t limited to restaurants only, but crept into my own kitchen as well. I can’t even count the recipes that I’ve tried until I came up with the one that is absolutely perfect to me. It is creamy, well balanced between mascarpone, eggs and sugar, the lady fingers dipped in espresso and liqueur for a second to avoid a soggy pastry layer. The right ratio between the coffee and alcohol is as important as the kind of spirit. Brandy became my favourite over the years, no amaretto (too strong), no marsala or port (too sweet). 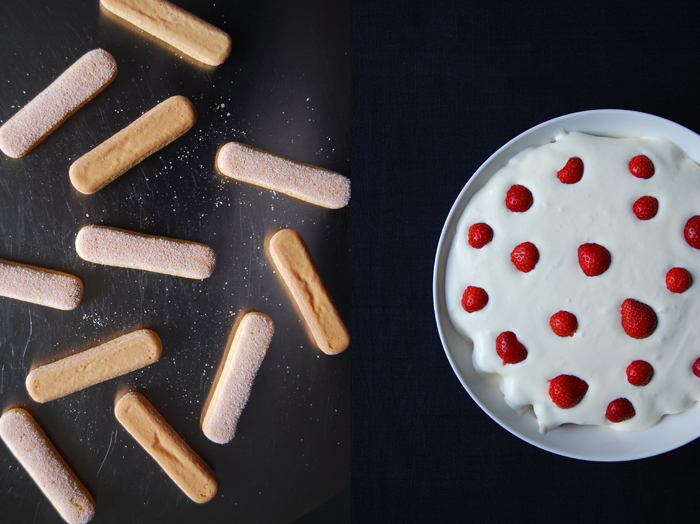 I don’t bake my own ladyfingers but I “invest” in good quality ones from Italy, that’s where this recipe originates and they know best how to make the perfect biscuits for this dessert. Funnily enough, I haven’t shared my tiramisu recipe on the blog yet although I’ve been wanting to write about it for months (and I’ve made it a couple time since I started eat in my kitchen). 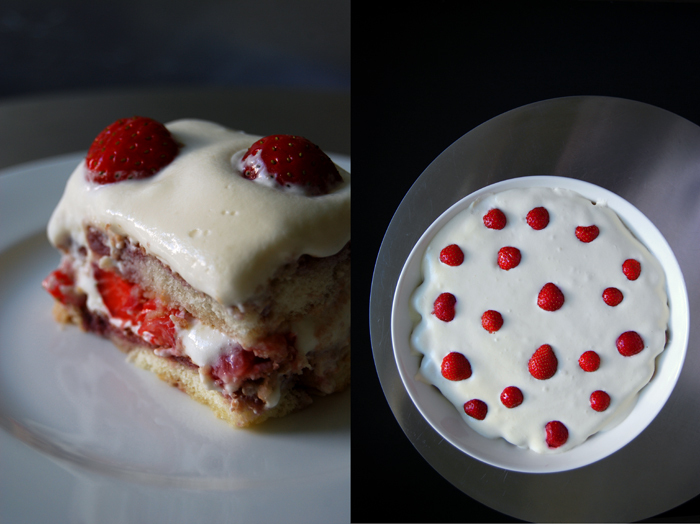 Today I won’t even share my original recipe but the fruity summer version, my strawberry tiramisu! I promise, the classic one will come soon but for now it’s all about the fruit. Delicious nonetheless, if you have a dinner party ahead of you and you’re still looking for a dessert that you can prepare in advance, try this one. My guests always love it as much as I do! Before I forget to mention it, the ladyfingers are dipped in a syrupy juice made of red wine, strawberry and sugar cooked for two minutes. It’s fruity and sweet with a bit of a red wine aroma, not too much, just a hint. The tiramisu is best when it can sit for at least 10 hours. In a sauce pan, bring the wine, 50g / 2 ounces of the strawberries and 40g / 1.5 ounces of the sugar to a boil and cook (open) for 2 minutes on a medium heat. Strain and pour in a deep plate and let the syrup cool. Beat the egg whites and salt till stiff. 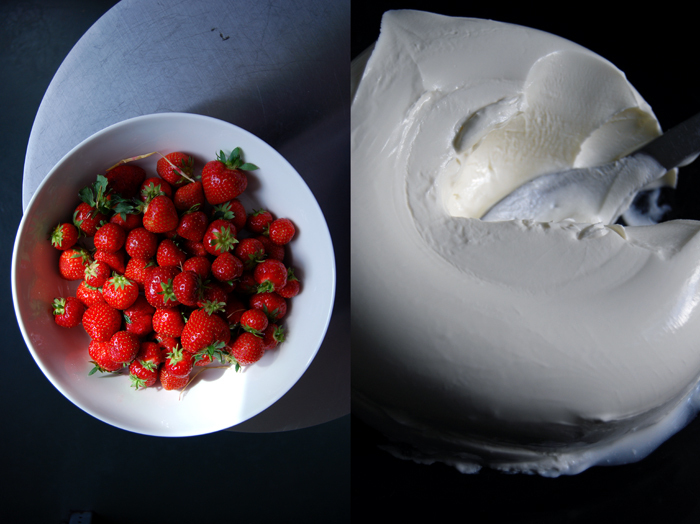 Whisk the mascarpone till creamy. 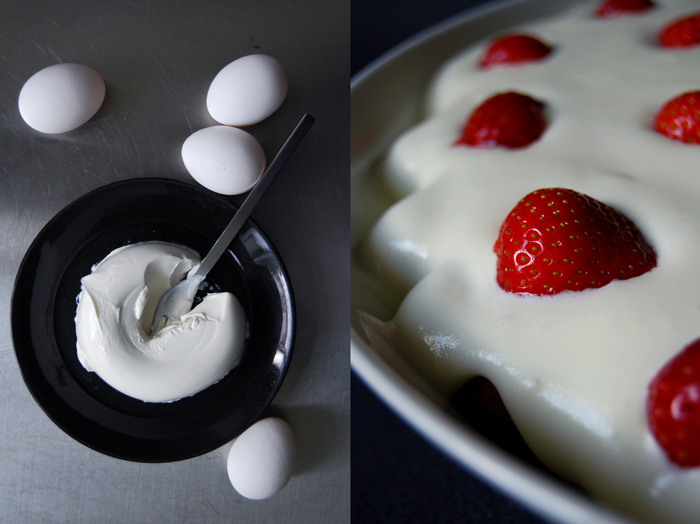 Mix the egg yolks and 60g / 2.5 ounces of the sugar till thick and creamy and add the mascarpone. Mix well until combined and gently fold in the egg whites. Dip the ladyfingers’ bottom side (unsugared) in the syrup, for 1 second, they will soak enough liquid to soften overnight. If you leave them in longer they become soggy. Lay out a tight layer of ladyfingers (sugared side down) in the dish. 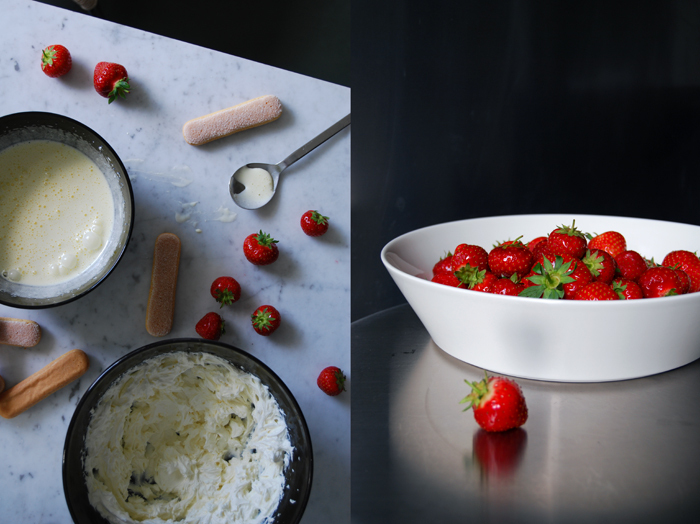 Gently cover with half of the mascarpone egg mixture and put the sliced strawberries on top, pushing them down carefully. Spread out another layer of syrup-dipped ladyfingers and cover with the remaining cream. 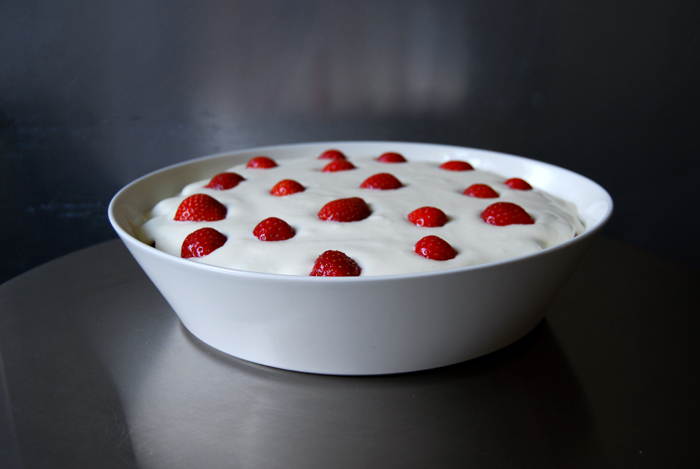 Decorate the tiramisu with the strawberry halves, cover with cling film and keep in the fridge for at least 10 hours before serving. I, too, love the traditional tiramisu, but this strawberry one has caught my attention. Do you use a particular wine, pinot, shiraz, merlot, or just what you have opened? I used a simple dry red wine. 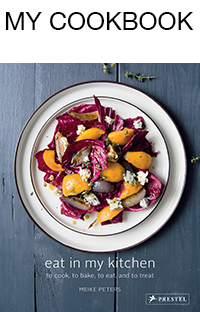 Merlot or shiraz is fine, it’s not necessary to get an expensive one for this recipe.